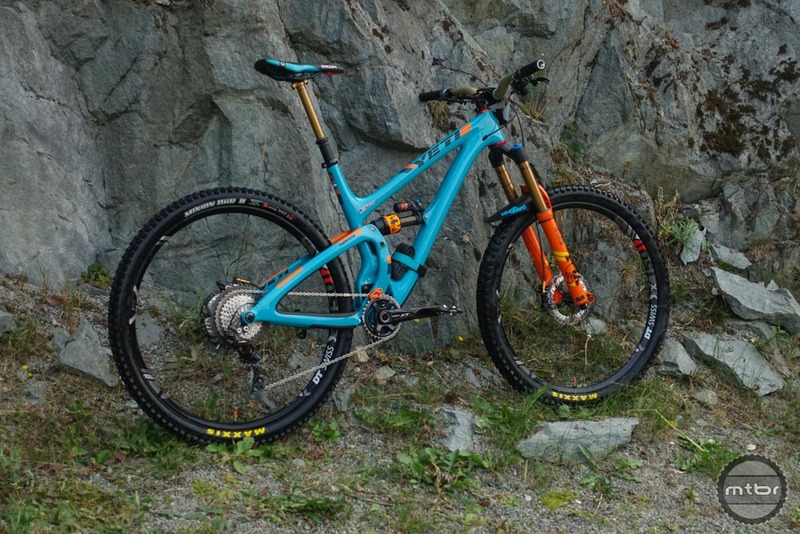 Cody Kelley’s bike of choice is the SB5.5. Cody Kelley may not be the best known name in enduro racing, but he might have the best hair. His flowing gold locks, killer style, and infectious good humor have made him a fan favorite on the EWS circuit. Get a closer look at Richie Rude’s SB6 here. His bike of choice is the Yeti SB5.5. 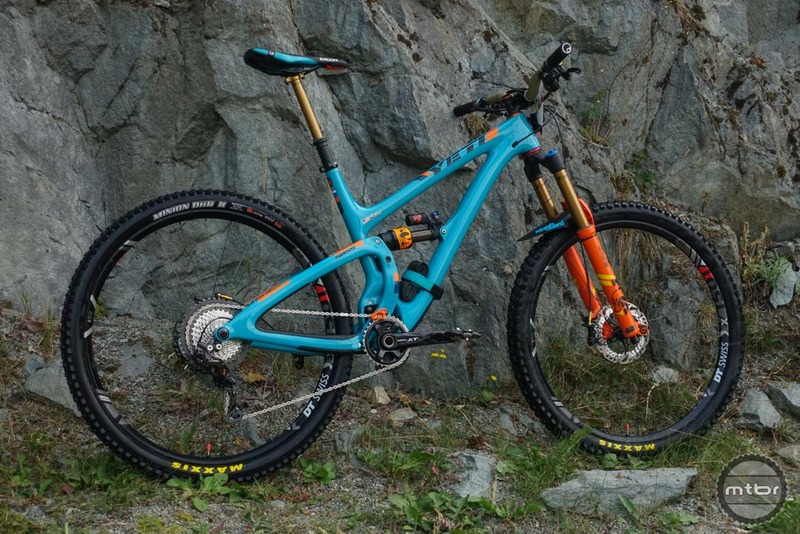 With only 140mm of travel, this 29er is highly playful – which suits Kelley’s riding style just fine. 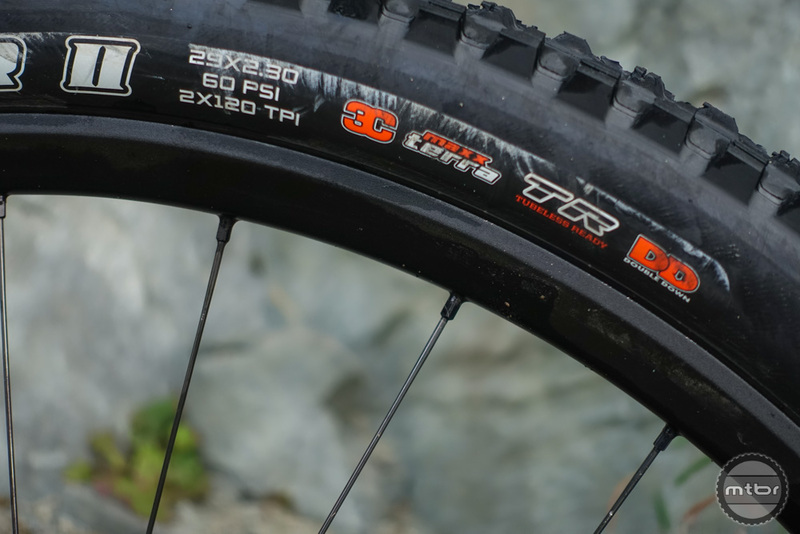 For less aggressive tracks, he’ll sometimes switch to the SB5, a 127mm travel 27.5”. That’s a sharp contrast to teammate Richie Rude, who prefers the SB6. Electrical tape wrapped around the cable housing keeps things tidy and quiet. 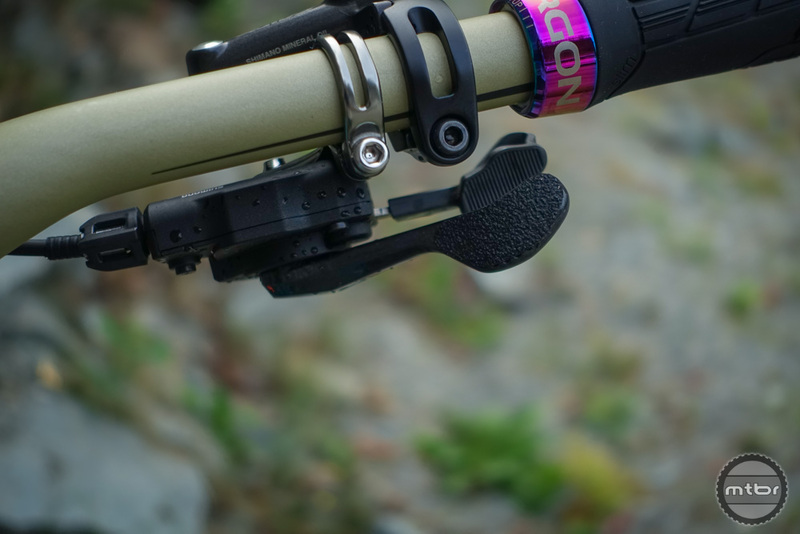 Cody and Richie both stash tools in their steer tubes with the One Up EDC tool. Full review here. While the market may have moved to the 35mm standard, Cody and Richie are both running 31.8 stems. Another interesting fact? Both athletes are on 740mm wide bars. 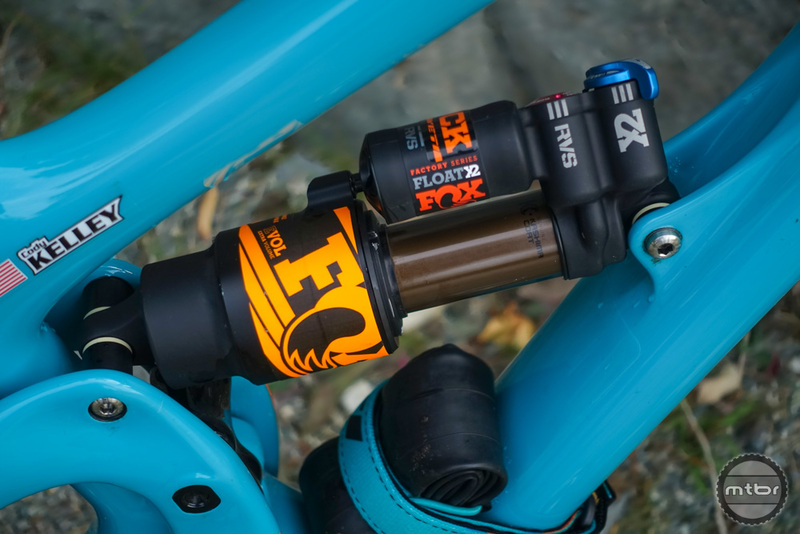 Their bar of choice, the Fatbar Lite, is only available in this configuration. 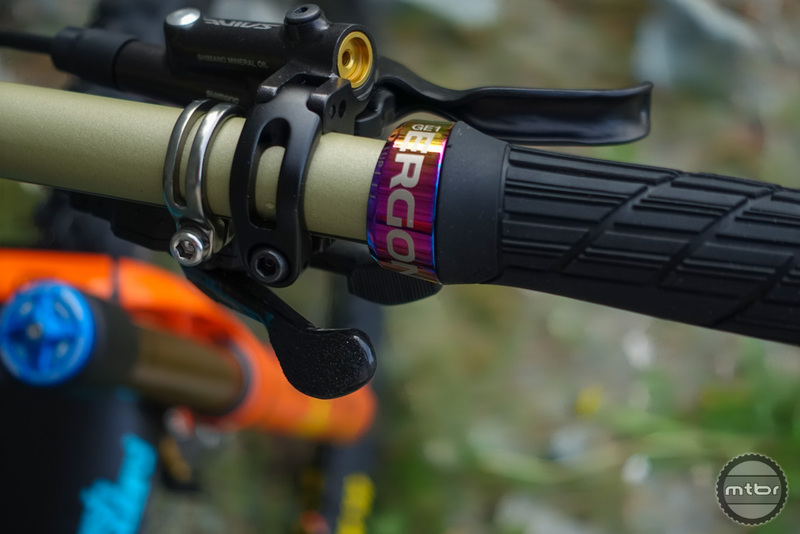 Cody runs a set of Ergon GE1 grips, which add a little extra width. 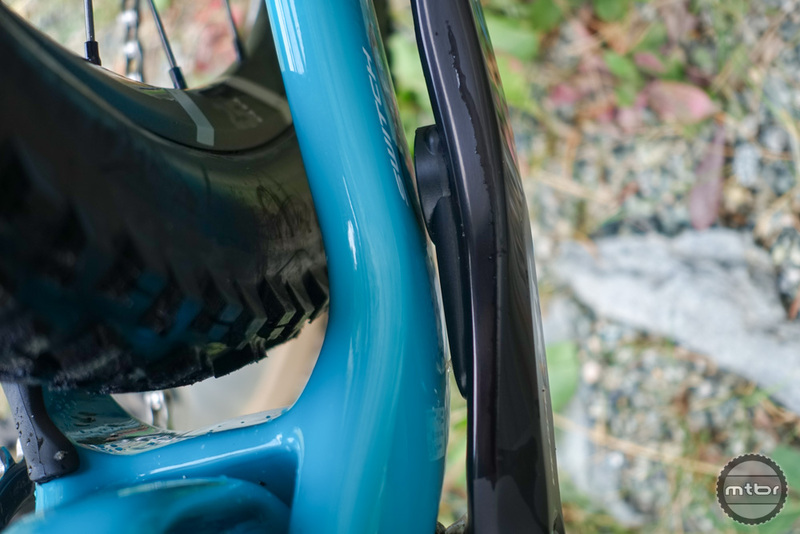 We’re big fans of that oil slick colored lock on. 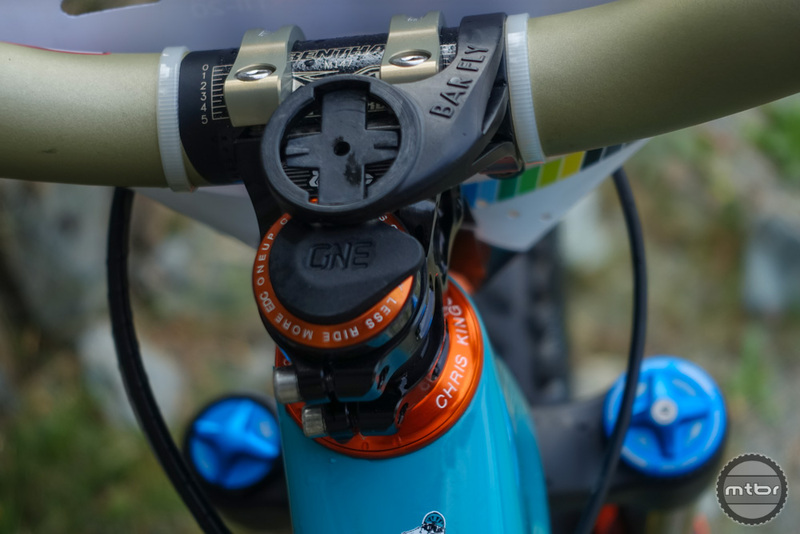 The EWS series has been unusually wet this year, which earned it the nickname “Enduro Wet Series.” To ensure grip in any conditions, Cody’s mechanic has placed a strip of grip tape across the shifter pad. 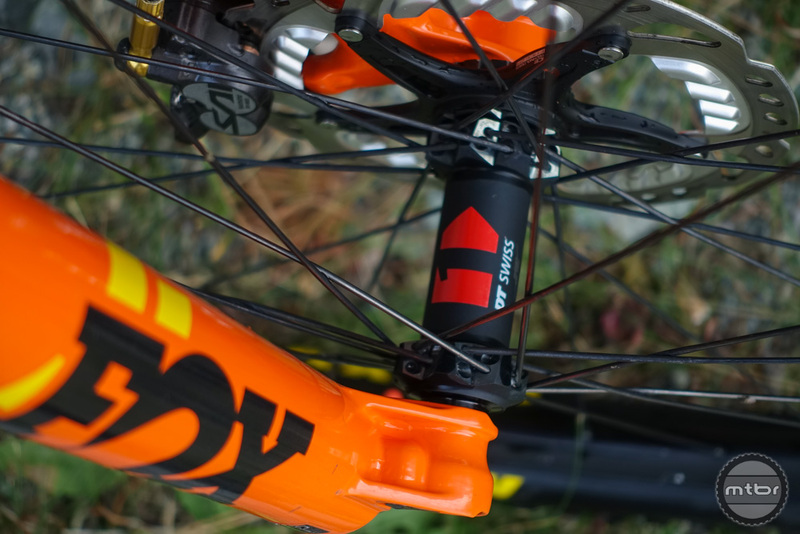 Like many EWS racers, Cody prefers to run his fork on the stiff side. 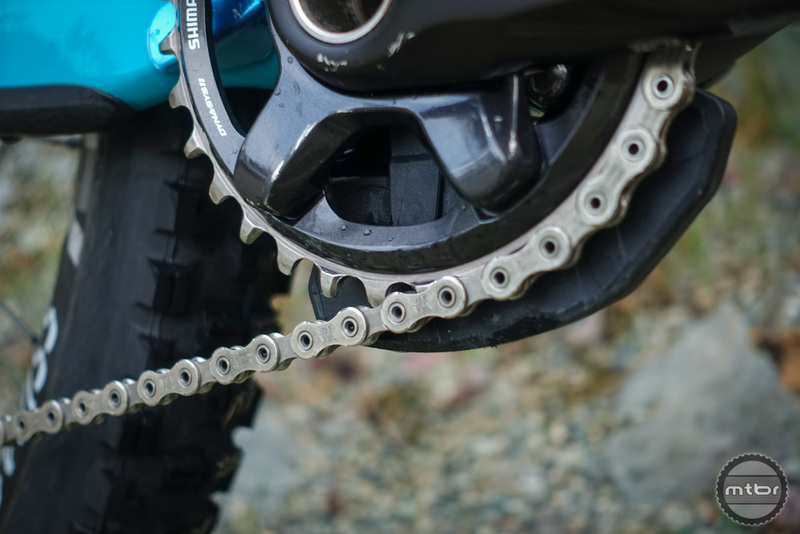 The goal is to keep the fork from diving when tracks get steep and technical. 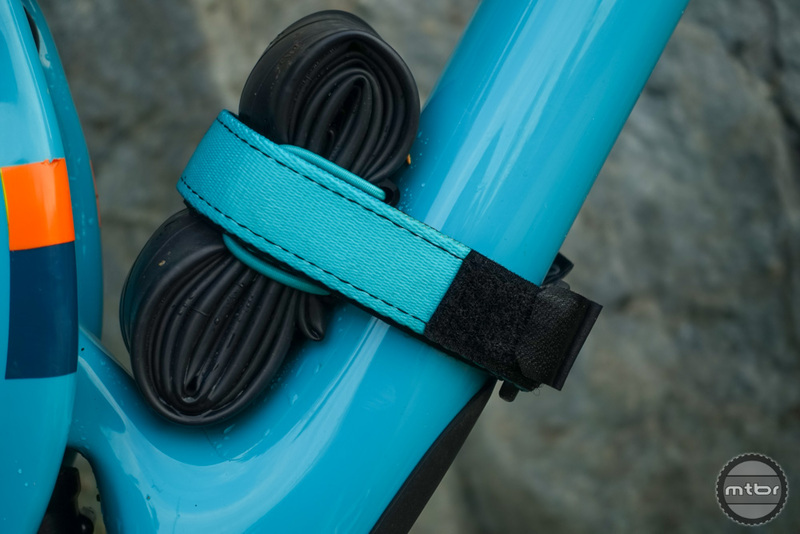 neatly in his headtube, Cody relies on a Backcountry strap to secure a spare tube to his frame. Of course it’s color matched and branded. A Fox X2 provides rear squish. 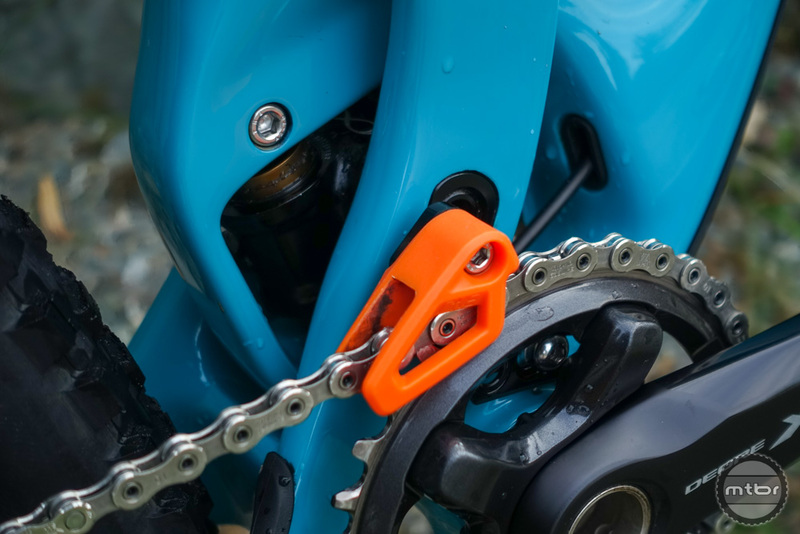 One Up’s minimalist top guide keeps the chain mounted securely. 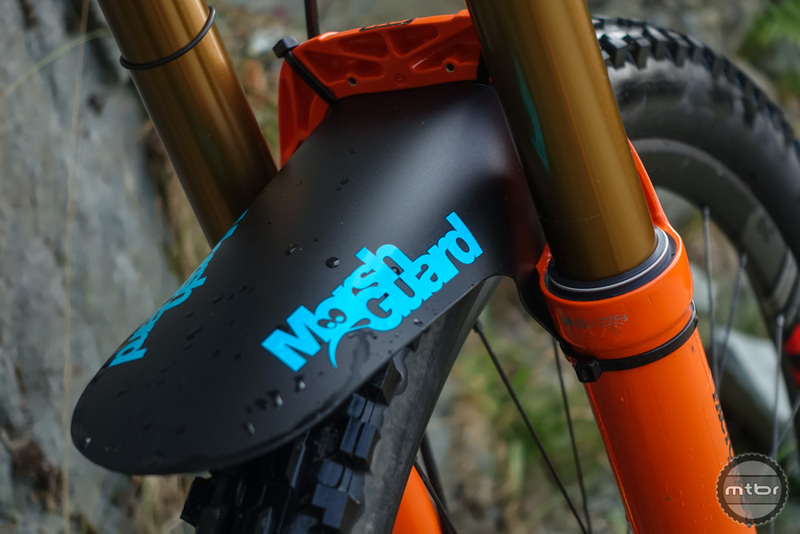 There’s also a bash guard, just in case. 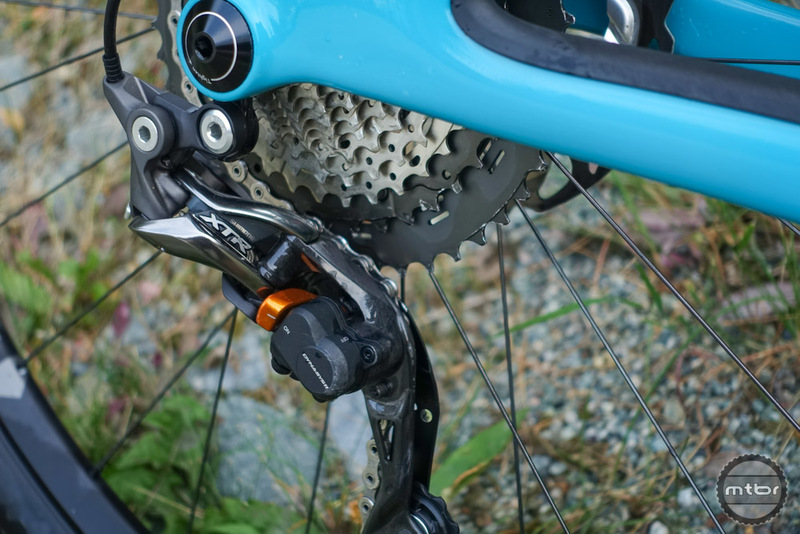 Who doesn’t love Shimano pedals? Both Cody and Richie run power meters. Cody runs a Cush Core tire insert in the rear. 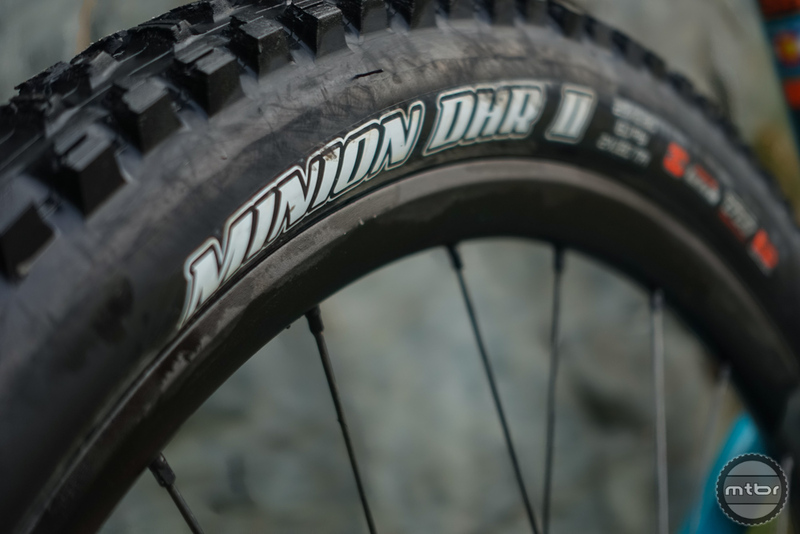 It allows him to run lower tire pressure and improves sidewall support. In the event of a flat, it also holds the tire in place, allowing him to finish the stage. This year, Cody’s been running Double Down casings front and rear. He usually runs around 24 PSI up front, 28.5 out back. 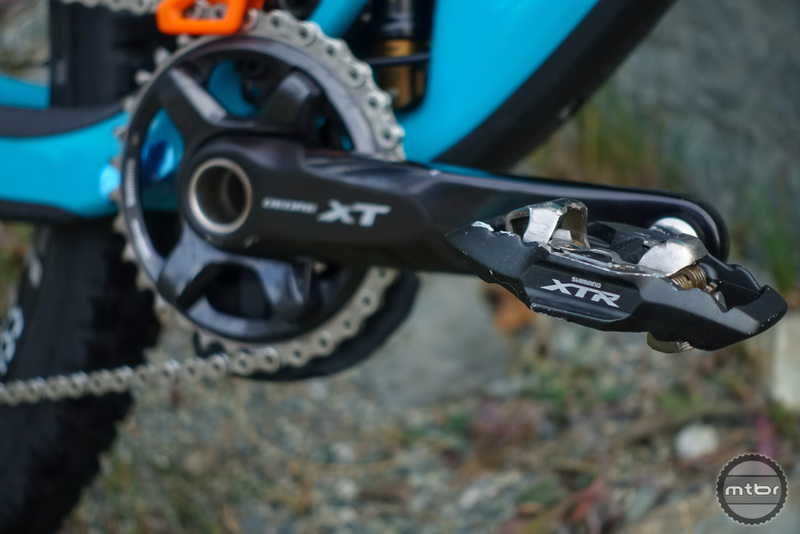 The drivetrain is a mixture of XT and XTR. 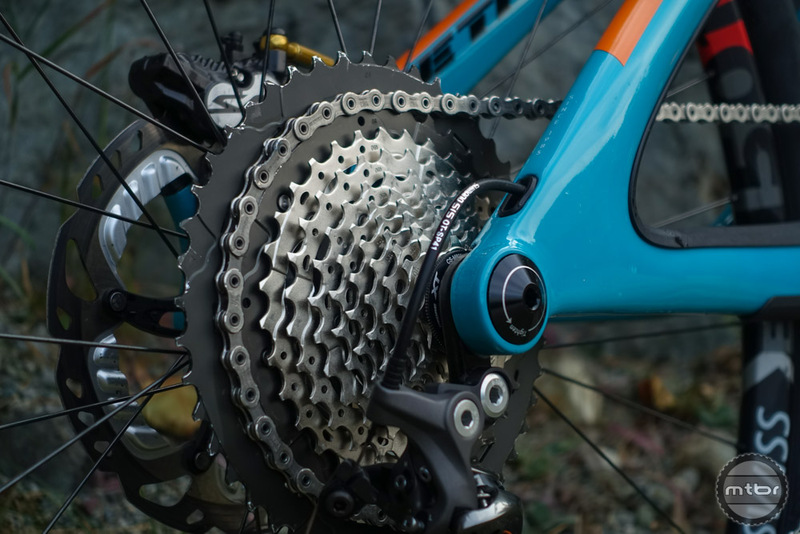 Like many athletes, he prefers the 11-46T XT cassette for the extra range. 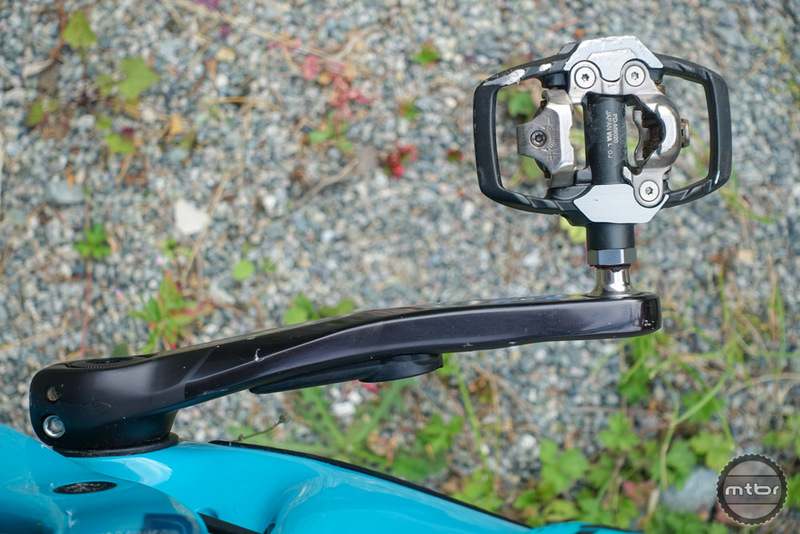 One unique thing about Cody’s bike is how he runs his brake levers. He prefers his front brake lever to sit closer than his rear. He’s not sure why, but if he tries to run the levers with equal throw, he over brakes. Is there anything you’d change on this bike? Want to follow Cody Kelley on his next adventure? Give him a follow on Instagram. Cody Kelley’s bike of choice is the SB55. 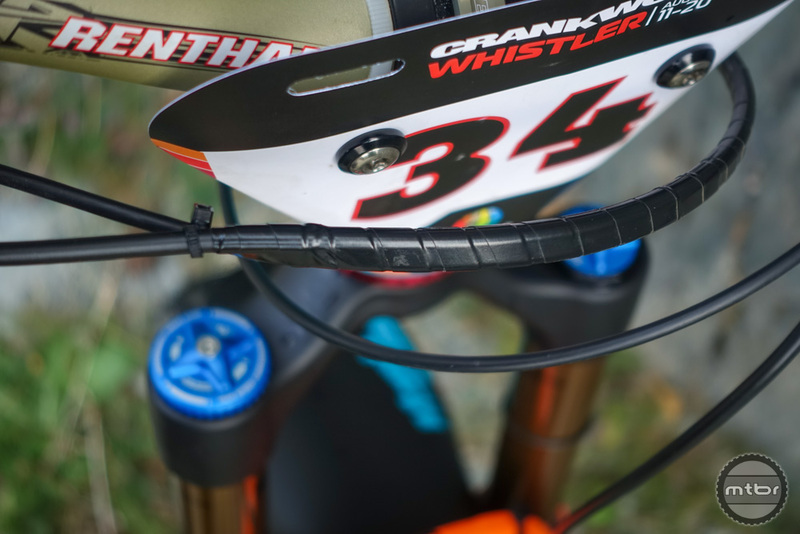 The EWS series has been unusually wet this year, which earned the nickname “Enduro Wet Series.” To ensure grip in any conditions, Cody’s mechanic has placed a strip of grip tape across the shifter pad. 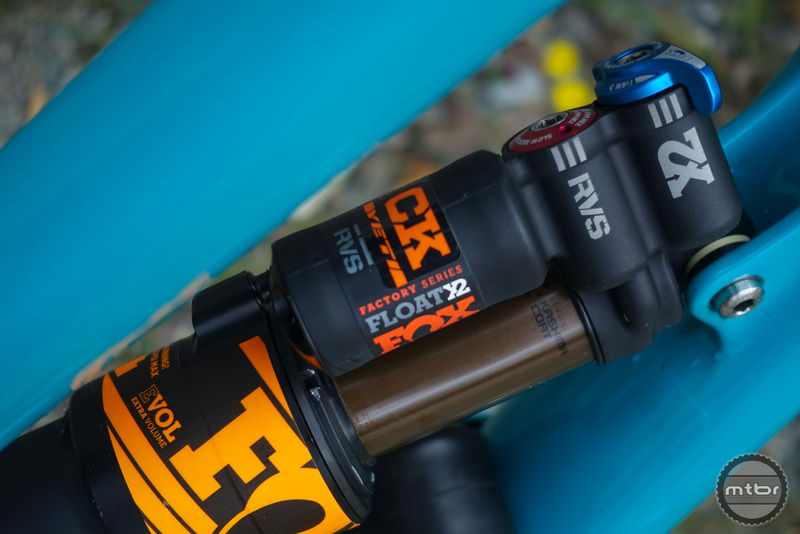 Like many EWS racers, Cody prefers to run his fork on the stiff side. As he explains it, the tracks are incredibly steep, so he’s trying to prevent the fork diving. The Marsh Guard is in place in case of rain. 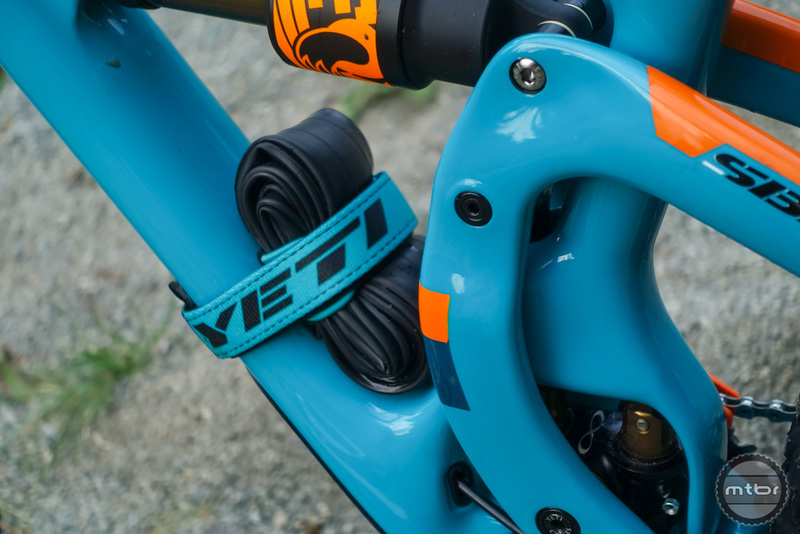 With his tool essentials neatly stored in his headtube, Cody relies on a Backcountry strap to secure a spare tube to his frame. 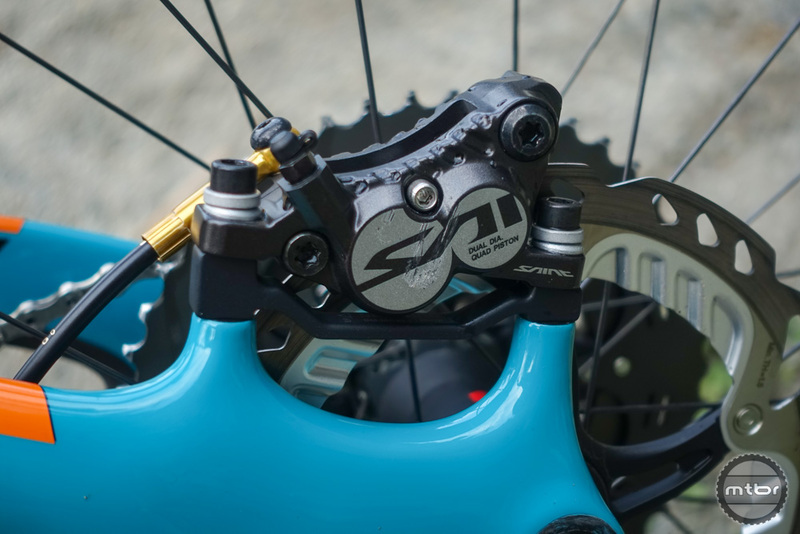 One unique thing about Cody’s bike is how he runs his brake levers. He prefers his front brake lever to sit closer than his rear. He’s not sure when he started running his brakes this way, but has found if he tries to switch back, he over brakes. 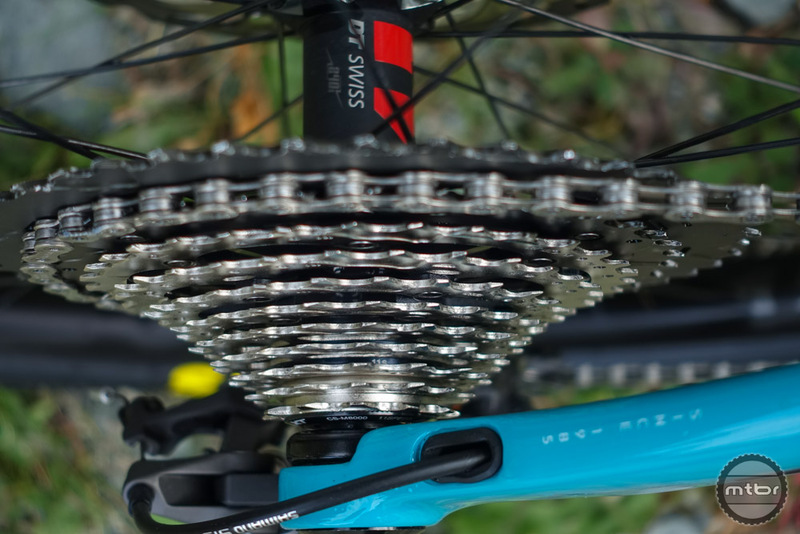 I suspect both riders are on the 31.8mm Fatbar Lites because they have more give than the 35mm bars. 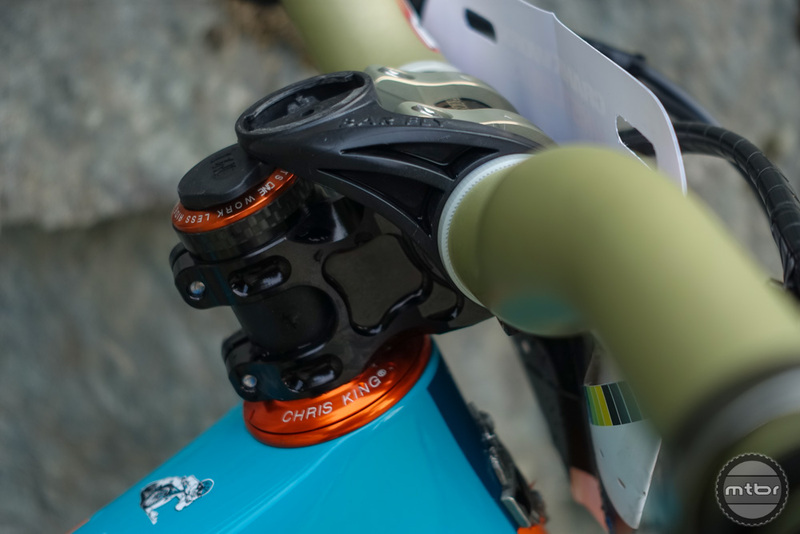 If these guys don’t need the extra rigidity offered by 35mm bars, then I certainly don’t. I enjoy the bike checks with the air pressures and all, lots to take note of. 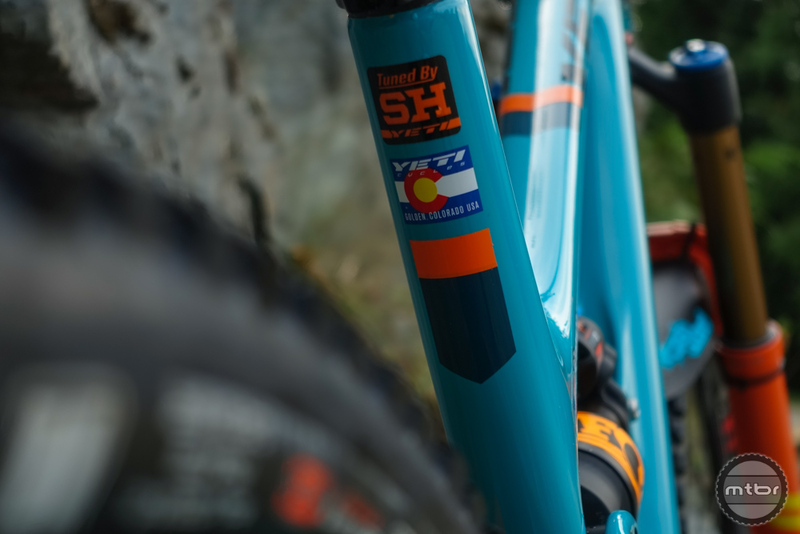 @Suns_PSD Renthal claims they worked hard to match the flex and ride characteristics of their 35mm bars to their 31.8mm bars….But I have a sneaking suspicion you might be right. Glad you’re digging the bike checks! I have a few more I need to publish. Yeah great article, shortish yet detailed and on topic. 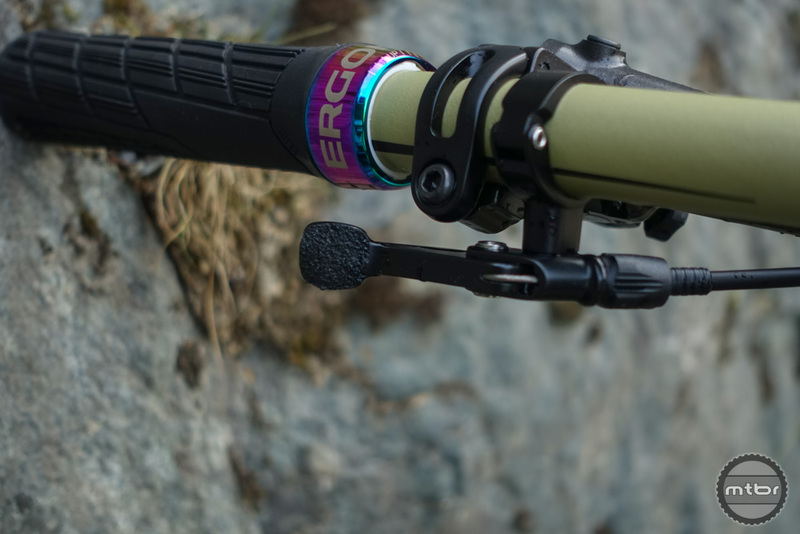 Nice pics and great looking rig.